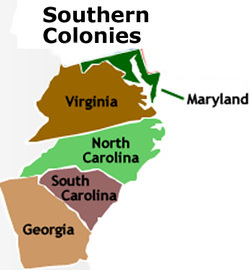 The souther colonies are made up of 5 states, South Carolina, North Carolina, Maryland, Virginia, and Georgia. There were many different types of religion in the southern colonies. Many Catholics settled in Maryland, but they were quickly outnumbered by protestants. Puritans tried to seize power in Maryland. For a while there was a no-catholic law, but it was eventually restored. Maryland was originally founded by English Catholics, though. North and South Carolina were founded by English friends of King Charles. Georgia was created by King Charles to get rid of people he not wanted in England. Virginia, of course, was settled by the English. Jamestown was founded here and was the first colony to be settled in all of America. Many of the immigrants in this region came for religious freedom. Also some where sent her if they were no longer wanted in England, specifically they were sent to Georgia. Going back to religious freedom, it started out working well with just a small amount of Christians. Then they were outnumbered by the Protestants, who were taken over by the Puritans. Eventually it was evened out though and the main goal was no longer gaining land. It became harvesting tobacco and other products to become welcome. These colonies are bordered by the Appalachian Mountains on the west side. In the east it is really flat land. This is known as TIdewater. TIdewater has a soil and climate that made warm-weather crops go well. Large plantations were formed along the rivers and costal areas that are also found on the east side. As the plantations along the rivers grew, a very elite style came upon the Southern Colonies. They all became very wealthy, other than the slaves of course. The angelican church was already established in the South. However, as time went on the religions started to grow in diversity. The Southern colonies were said to have religion tolerance, this was to attract settlers. Eventually every Southern Colonies government allowed an elected representative assembly. 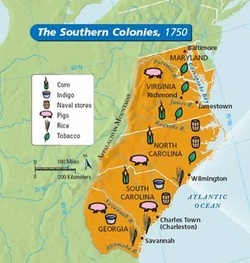 Maryland based its economy on growing tobacco. This crop quickly used up nutrients in the soil and workers had to clear more land. Planters where always searching for laborers. Most tobacco workers were servants or slaves. There were large plantations everywhere. Other things planted here were turpentine and indigo. Tobacco was main supplement here, though. In Carolina the main supplement was rice. Many slaves were hired to harvest rice. The southern colonies became very wealthy from all the harvesting done here.